A Rs 48,000-crore budget for the national capital was presented by the AAP government, laying major focus on improving transport, health, water distribution and education infrastructure. In its third Budget, the Arvind Kejriwal government abolished the plan and non-plan expenditure heads and presented it in terms of revenue and capital classification in line with the Centre’s decision. There was no proposal on levying any new tax. In a first, Deputy Chief Minister Manish Sisodia, who holds the finance portfolio, also presented an “outcome budget” which he said would act like a “contract” between the government and the people. Sisodia asserted that the economy of the state will grow “despite demonetisation”. At the same time, he said note ban has led to contraction in the city’s estimated GSDP for the ongoing financial year (at constant prices) although it will still be higher than the projected growth at the national level. At current prices, the national capital’s economic growth has been pegged at 12.76 per cent. “When we allocate money for skywalk, merely constructing it would not be counted as success. Its success would depend on how many people actually use it. That in a nutshell explains the objective of the outcome component,” he said. Eyeing the municipal polls, the government has earmarked a record Rs 7,571 crore for the civic bodies, which comes to about 15 per cent of the total allocation. The government alloted Rs 11,300 crore for education, about 24 per cent of the total Budget, to the education sector. Last year’s allocation was Rs 10,690 crore. 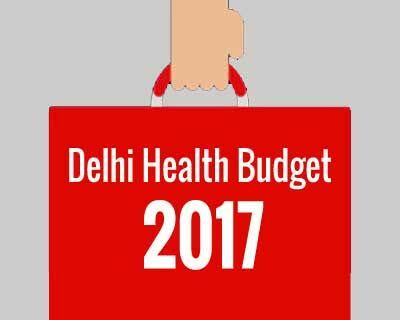 An outlay of Rs 5,736 crore has been made for the health sector, a priority area for AAP government. Rs 1,156 crore has been set aside for the phase four of the Delhi Metro while Rs 100 crore has been earmarked for developing bus terminals and depots. Sisodia said Delhi’s contribution to India’s GDP has increased from 3.94 per cent in 2011-12 to 4.08 per cent in 2016-17. The size of the budget for 2017-18 is Rs 48,000 crore. The Deputy Chief Minister said VAT on Aviation Turbine Fuel will be brought down from 25 per cent to 1 per cent for flights to remote areas such as North Eastern states to compliment Centre’s regional connectivity scheme. Sisodia said the AAP government will continue to give subsidy to battery-operated vehicles as part of efforts to promote eco-friendly public transport system. He said Rs 2,100 crore has been allocated for the water sector and cleaning of Yamuna while Rs 3,100 crore has been earmarked for Urban Development. The budget of Delhi Commission for Women (DCW) has been increased by three times with a total allocation of Rs 120 crore. The power sector has been given an allocation of Rs 2,194 crore, Sisodia said adding special emphasis will be on developing solar energy and waste-to-energy plants. Rs 57 crore has been set aside for the environment department which spearheads the anti-pollution initiative in the city.